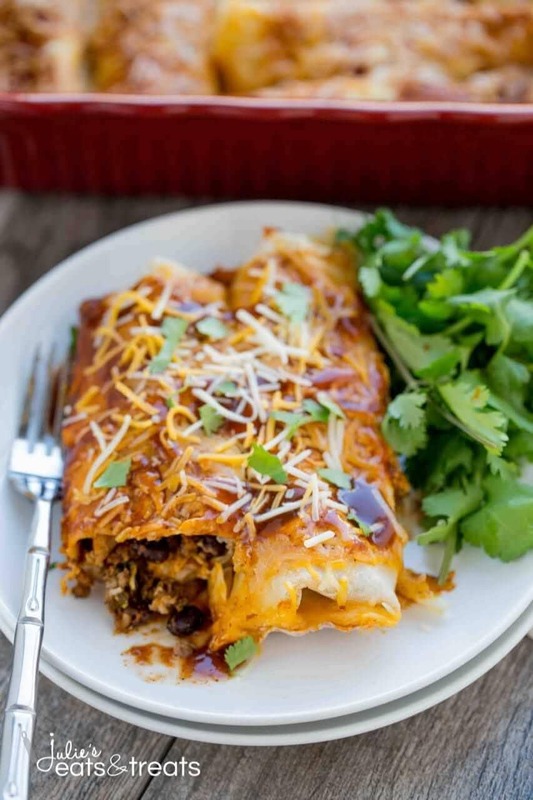 Beef and Potato Enchiladas Recipe ~ These Potato Enchiladas loaded with delicious ground beef, crispy potatoes and tender vegetables! The Perfect, Easy Homemade Mexican Dinner Recipe! Hi guys. How’s your day going? I’m having a great day but I need to ask you all an important question. Are you a Mexican food lover as much as me? I’m seriously obsessed with it. 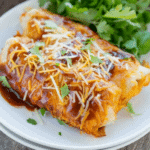 These Beef and Potato Enchiladas are one of my favorites! Soft shell tacos stuffed with seasoned ground beef, potatoes and cheese. They are such a fun twist on Mexican food, plus my husband is always looking for me to make more beef and potato recipes. That guy loves meat and potatoes! It’s the farm boy coming out in him. It’s pretty sad because I could eat it every single night. No joke. 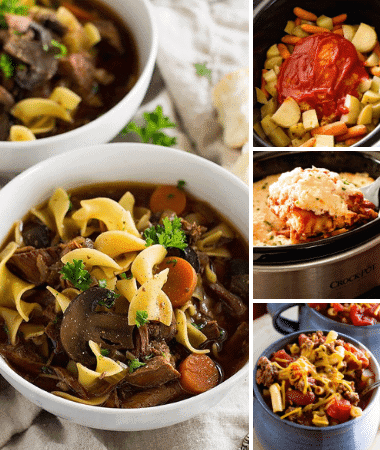 There’s just something about the taste and flavor that I love, plus I don’t have to cook or clean up! Although, when I make homemade Mexican recipes I make a big batch of seasoned ground beef or shredded chicken or beef. Then one night you can eat tacos or taco pie, then the next you can have fajitas or enchiladas. The list can go on and on. 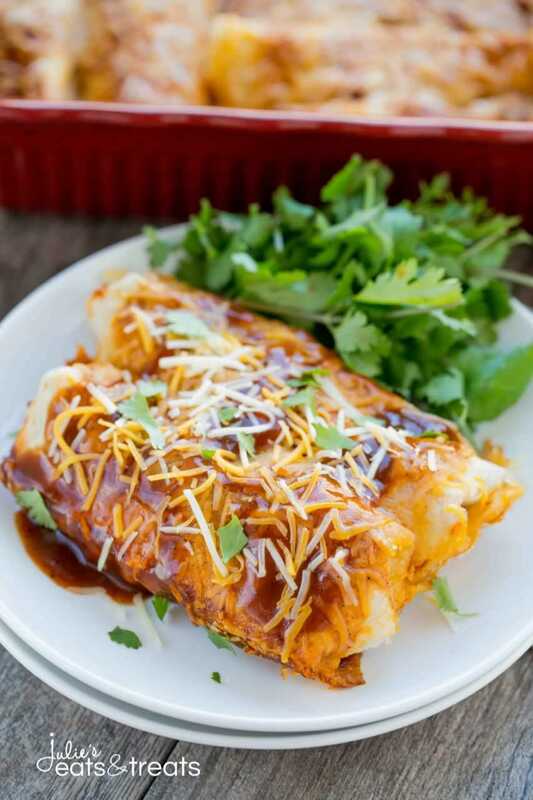 What do I need to Make Beef and Potato Enchiladas Recipe? There are just so many different options. Add in some chips, salsa and guacamole and you’re in heaven. See there are just so many different ways to eat Mexican food. I never get sick of it. I do feel kinda bad for my family. They get sick of eating it all the time. So I decided for two weeks I wouldn’t make any type of Mexican food. I would have them detox from it and cook anything but Mexican food. I was miserable with out my fix, but I told myself that I would make them miss it. Hehe. Plus I went to our local taco shop when every one was at work/school. Shh our secret k. Guess what happened after 2 week? Yep you guessed right. They were begging me to make them some good old Mexican food. Ha! Jokes on you family. I knew they would miss it just as much as I did. 🙂 I wanted to make something new and decided these Beef & Potato Enchiladas would be a hit!! They turned out so good. In all honesty I threw them together. I had all the ingredients on hand and thought they sounded delicious? I’m so glad I thought of these them because they turned out better than expected. They’re on our menu at least once every other week now. Yum!! 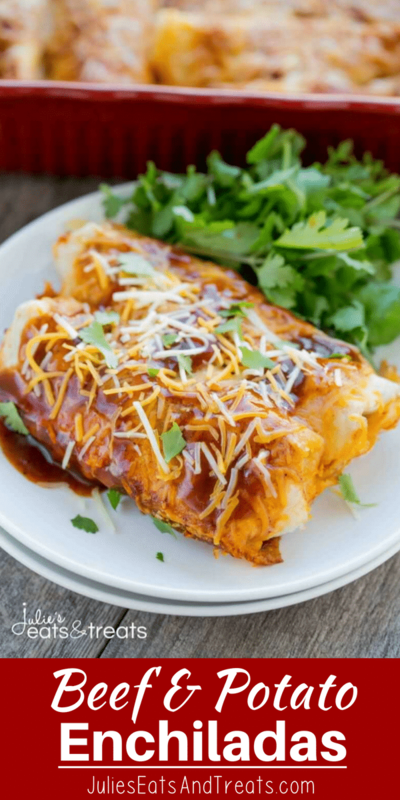 Loaded with ground beef, potatoes, vegetables and packed with delicious flavor these enchiladas are a winner with the family. Do I Use Flour or Corn Tortillas When Making Enchiladas? Traditionally corn tortillas are used for enchiladas, but flour tortillas also work. I, personally, prefer flour tortillas but either work! It’s a great way to mix things up. If you are using corn tortillas they are more pliable and easier to roll if they are heated first. Simply wrap them in foil and bake in 350 degree oven. 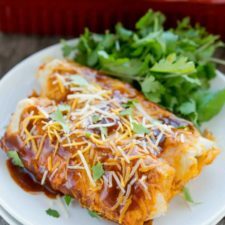 What Do I Serve with Beef and Potato Enchiladas? 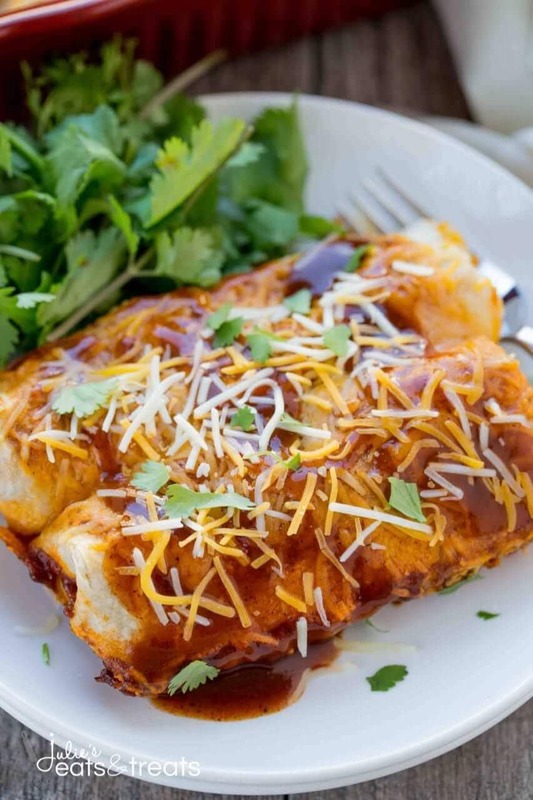 The next time you’re making some Mexican food, remember these Beef & Potato Enchiladas. The family will love them. They will be begging you to make them over and over again. Enjoy! Preheat oven to 350 degrees F. Spray a 9x13 baking dish with non-stick cooking spray; set aside. In a large skillet over medium high heat, add ground beef, onion and bell pepper. Cook and crumble until meat is no longer pink, about 7-10 minutes. Drain, place back in skillet and turn heat to medium heat. While the beef is cooking, add the potatoes to a microwave safe bowl and cover with water. Microwave potatoes for 3-5 minutes or until desired tenderness. Add garlic and potatoes to the meat skillet and stir to combine. Sprinkle taco seasoning over meat and potatoes, stir to combine. Add water, cover and simmer over medium heat for 5-10 minutes. Stir in 2 tablespoon cilantro and black beans. 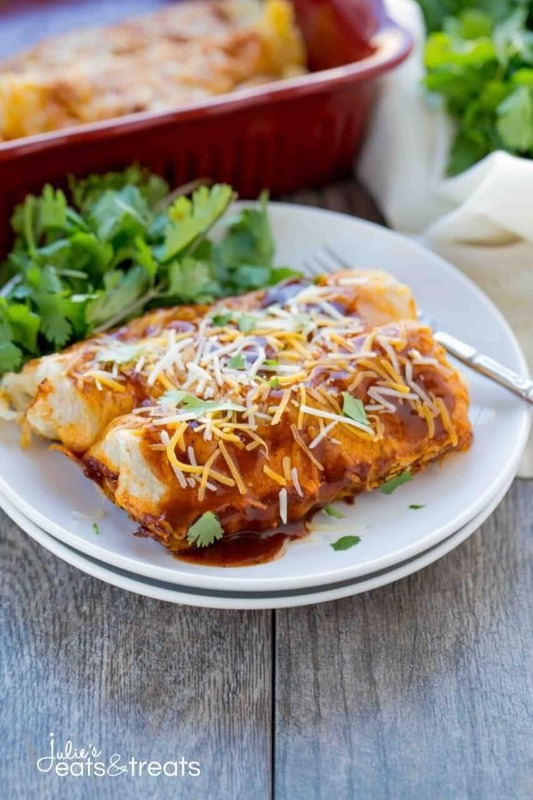 Assemble enchiladas by taking a tortilla, add 2 heaping tablespoons of meat potato mixture, sprinkle of cheese and a drizzle of enchilada sauce. Roll and place in prepared baking dish. Repeat until meat potato mixture is gone and desired amount of enchiladas are made. Cover with remaining enchilada sauce and shredded cheese. Bake 15-20 minutes, or until cheese is melted and bubbly. Let stand for 5 minutes. I actually just started using Sprouts brand of enchilada sauce and it’s really good. I recommend trying that one. Thanks! !